Marple Poppy Appeal back on track with over £15k raised in 2017! As well as revitalising the distribution of the poppies and collection tins to local shops and businesses, organising volunteers to man the stall in Asda and selling wreaths to local groups, the new team provided local primary schools with a 'kids pack' that featured poppy designs especially for the younger generation. They also organised a gazebo in Market Street to sell poppies on Saturday 4th and Saturday 11th November, which is the first time that has been done. 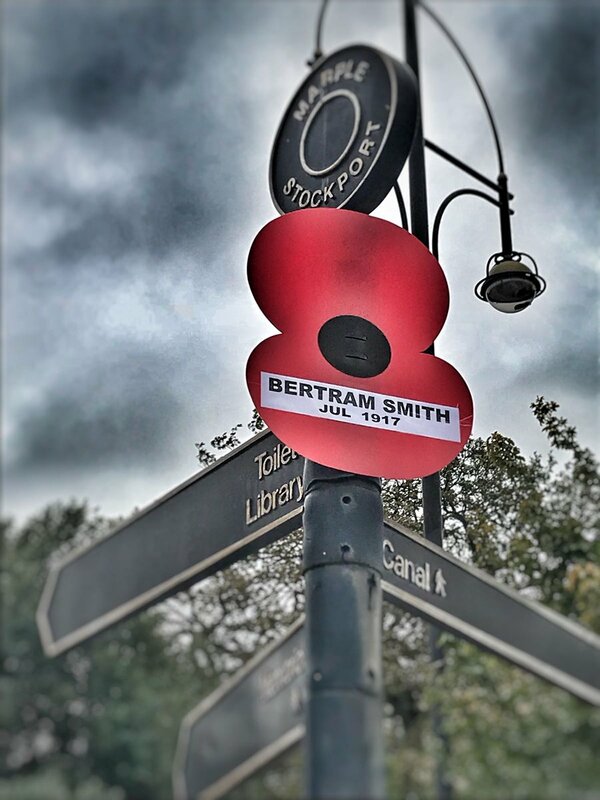 Additionally, inspired by the WWI Timeline in Marple Memorial Park (in turn inspired by the book Remembered written by local authors P. Clarke, A. Cook and J. Bintliff) the team arranged for 46 large Street Poppies to be put on lampposts in Marple, Marple Bridge and Compstall bearing the names of the men listed on the Marple War Memorial killed 100 years ago in 1917. The Marple Website was delighted to help Kevin, Mike and Ron promote the 2017 appeal and assist their search for volunteers for Asda and for sponsors of the Street Poppies. Of course it only seemed right to sponsor the Street Poppies too, with a small donation of £20 to the RBL Poppy Appeal. The best news of all is that the Poppy Appeal in Marple for 2017 raised a superb total of £15,237.43 for the Royal British Legion. This is an amazing sum from a place the size of Marple and the organisers have acknowledged the help of The Marple Website and also the Marple Review in promoting and publicising the appeal this year, and helping to bring in so many new volunteers to help. The Team (left to right below: Kevin, Ron and Mike) offer their sincere thanks to all of the above and to everyone who has helped in any way throughout the appeal.